Ian Gent's Blog: Ho, Ho, Who? Interior, Parents' bedroom, Christmas Eve. Dad: Do you think you got away with it? Interior, Child's bedroom, Christmas Eve, Fifteen Minutes earlier. Virginia: Mum, it's him, isn't it? I know Santa is Dr Who. M: Yes Virginia, of course Santa is Dr Who. V: I worked it out! It has to be. How else could one person deliver presents to all the children in the world in one night? V: It's the TARDIS! He can go all over the world, street by street, and get into the TARDIS and go back in time a few minutes to go to the next street. That way he doesn't have to travel at faster than light speeds or anything, he just goes back in time. It's brilliant! M: Well dear, don't spoil it for everyone. They like to believe in magic. V: Oh of course not, you should hear some of the silly things people at school believe! But it's the TARDIS! Obviously, how could Santa get all those presents for everyone into one sleigh? Ridiculous! But the TARDIS, he just keeps filling it up and up and it never fills up, and off he goes with everyone's present. M: What about a flat without a chimney like ours? V: Oh Mum, have you even watched Dr Who? It's the sonic screwdriver! That can open any lock in the world. He just waves it and the door and walks in. And I know something else, too. V: He regenerated in between! Obviously! Of course he didn't look the same. He'd probably been through ten regenerations and thousands of trips back in time going to different towns talking to children. M: Time for bed dear. You wouldn't want to be awake when the Doct.. I mean when Santa comes. V: Night mum, I love you. Don't worry, I won't tell anyone what I've figured out. Mum switches light out. Switch back to scene in Parent's bedroom. Wrapping last few presents. Dad: She's a smart cookie. Just one little thing she didn't figure out. Nobody ever talked about Santa and his police box. Santa's TARDIS is still working and can look like a sleigh. 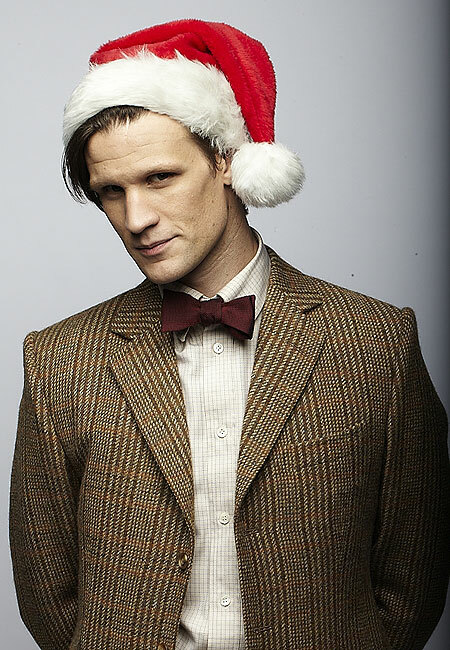 M: His entire lifetime and all his regenerations as a Time Lord spent delivering presents on Earth. D: And just for Christmas this year. More than a thousand years to deliver to every house that celebrates Christmas. At one minute a house. And working 16 hours a day, no days off. M: Next year they sacrifice some other poor Time Lord to do it all again. Why are they so cruel? M&D: Here's to you, Time Lord. We're thinking of you. Exterior, urban street decorated for Christmas. TARDIS sound effect as sleigh materialises. Santa climbs out of sleigh and opens door with sonic screwdriver and walks in. There is no spring in his step. Somehow I didn't want to spoil the story with notes, so here's the annotations. The thousand year things. If roughly a third of the world's population celebrates Christmas, that's something like 2 to 2.5 billion. Divide by 4 to 5 and you get maybe 500 million households. At one minute per house, sixteen hours per day, 365 days per year, you get about 1400 years. Many thanks to my wife for help developing all the different ways that Santa could be Dr Who, and Martin Bateman for the second link.